The first in this field! Photo catalysis type PROTEC has as much as 5-10 times of sterilizing purification power as that of ordinary ultraviolet rays type! It is the product that independently accomplished perfect sterilization of seawater and fresh water with copemican technique and obtained good results. 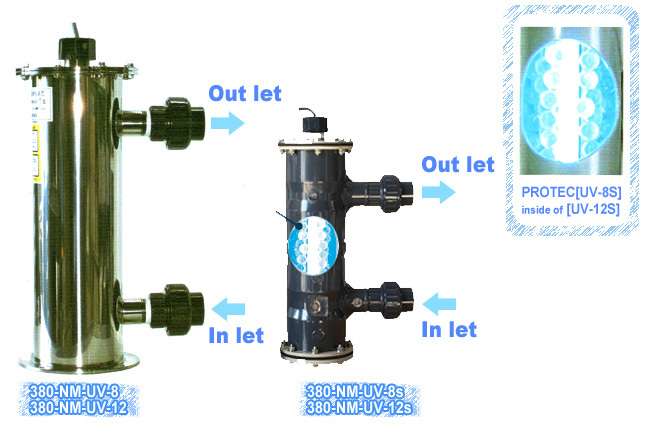 NEW MARINS original power sterilization/deodorization/urification equipment"PROTEC series"
"In a fish tank we succeeded to solve the unsolved problem till now." It is epoch-making product that stabilizes the water quality of the water tank of live fish and squid that was unstable,cloudy and spoiled. With the synergy effece of photo catalysis type sterilizing deodorizing purification equipment(respond to water,air) PROTEC NM-UV series ultraviolet rays lamp and photo catalysis(titanium oxide coating beads) decomposes most of the toxic substance with the higher safety and detergency than ozone,chlorine or ion etc. When staring the water tank,suppresses the instability of water quality. Water tank maintains always clean condition,removing muddiness. Prevents the spread of external wound or death of fish. Reduces the struggle of fish when put in/ take out from tank. Reduces the water changing times due to the stability of water quality. Because the water tank is purified and deodorized, the fish smell of the live fish decreases. Because it broke down organic matter etc. helps filtering. As less virus adhere to fish, raw food, like sashimi can be supplied safely. The most powerful sterilizing purification clarifier with combining light and UV. [UV-8S][UV12S] of PROTEC Series is cheap but has outstanding effecttiveness! With the synergy effect of ultraviolet rays and photo catalysis coating beads (light beads) it sterilizes, decomposes and purifies organic matter, with 5-10times more power of sterilizing and purification than ultraviolet rays sterilizer that has the same power. It has excellent clean up power,with powerful photo catalysis type, decomposing and removing bad smell and cloud that was impossible with ultraviolet rays sterilizer,By realizing light weight while keeping solidity with specially made ABS rosin casing that has strong tolerance to ultraviolet rays, and thus,it can be attached easily. By protecting UV lamp from the temperature change of water or from impact, with specially made quartz glass tube,excellent detergency and low price were compatible. Power stabilizer of UV lamp use, was made to be small and light weight, with IC inverter method. Because of no flickering till lighting, compared with the equipment of glow lamp spec., load is small and the life of UV lamp it self becomes long. 1.The effect in water tank, fancy fish water tank and pond. Decomposing organic matter, purifies water cleanly. Suppressing occurrence of spoilage bacteria, mold and algae, prevents disease and worsening of scratch of fish. Stabilizing water quality, decreases the number of times of water change. 2.The use of bathtub, pool,and tank etc. is limitless. Prevents the occurrence and multiplying legionella, colon bacillus and other various bacterium. Promoting the decompose of dirt, oil and stain of bath water, improves the filterability keeping the bath water clean. By decomposing toxic substance, prevents the occurrence of spoilage bacteria and bad smell,preserves clean water quality. Copyright(C) 2011 Newmarins Co.,Ltd. All Rights Reserved.